Victims of hate crimes recounted how the government authorities harassed them while justice continues to be elusive. Alwar: Khurshida has just managed to attend Karwan-e-Mohabbat in Alwar. Wary of leaving her children alone, she took some time to make a reliable arrangement. Her voice breaks as she recounts her ordeal. Every day, technologically handicapped Khurshida requests her brother-in-law to call the advocate to enquire about the status of her son’s case, but it’s of no use. This is the second time that Khurshida has become a part of the Karwan. 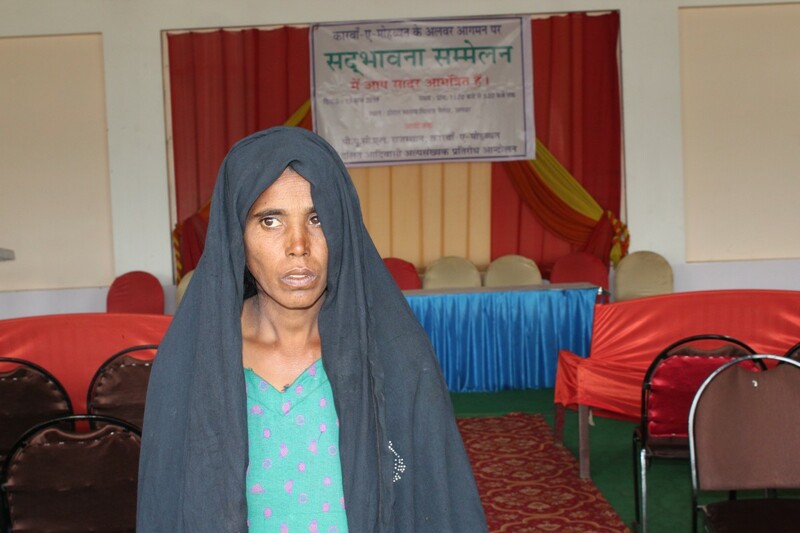 She first joined when her husband, Umar Mohammed, was allegedly shot dead and thrown on the railway tracks by cow vigilantes in Bharatpur while he was transporting cows to his home in 2017, during the tenure of Vasundhara Raje’s government in Rajasthan. On January 23 this year, after the newly-elected Congress government took charge, her eldest son Maqsood, who was the sole breadwinner in the family after his father’s death, was arrested on the charges of cow smuggling. Latching on to her hope for justice, Khurshida made an urgent plea to the Karwan team with folded hands. Saghir is dazed by the reception he has gotten here. After all, the last time he tried to raise his voice, he was beaten up by a group of men in Alwar’s Kishangarhbas over a road rage incident that later turned violent when the men discovered cows in his mini truck. Today, he is being heard and assured that, what happened that day, was not his fault. Karwan-e-Mohabbat is an initiative to counter the normalisation of hatred in the country. As a part of this objective, the Karawan team takes a journey across the affected regions, to let survivors open up about their sufferings and help them attain justice. 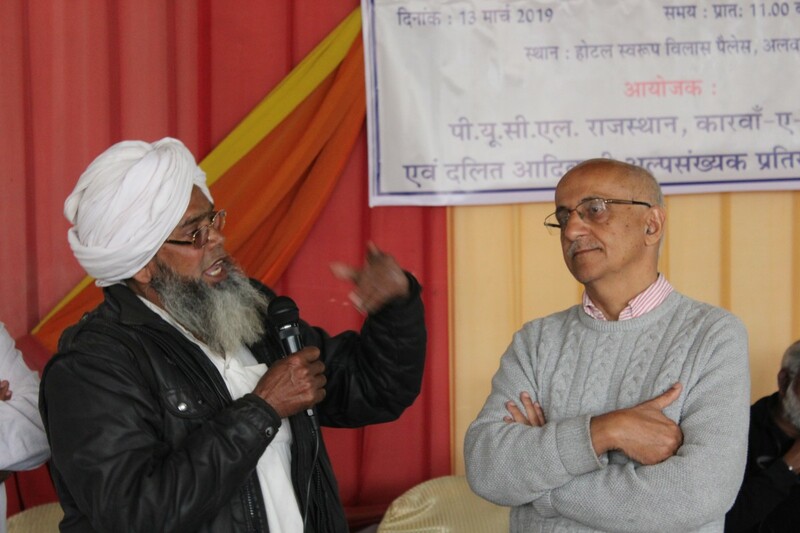 As Karwan-e-Mohabbat passes through the Mewat region, survivors of hate and violence in Haryana, Bharatpur and Alwar districts share their stories of injustice. Against the backdrop of a crucial election, the message this journey circulates is straightforward: The government should clear its stand regarding the incidents of hate violence proliferating across the nation. As the attendees spoke about their love for the nation and cows, there was discernable resentment amongst the Muslim community over the need to prove their loyalty to their motherland. They even requested to leave the event early as their pet cows were waiting to be fed. “We serve fodder to our cows thrice and water at least four times in a day. They don’t eat when we are not around and the leaders today want to teach us cow protection?” said Mohammad Sadiq, a dairy farmer from Kolgaon. Addressing the event, Kavita Srivastava, from the People’s Union for Civil Liberties (PUCL), put forth the need to review the state bovine act that has been used as a tool to book innocent Muslim men for allegedly smuggling cows. “Sangh has a double face. 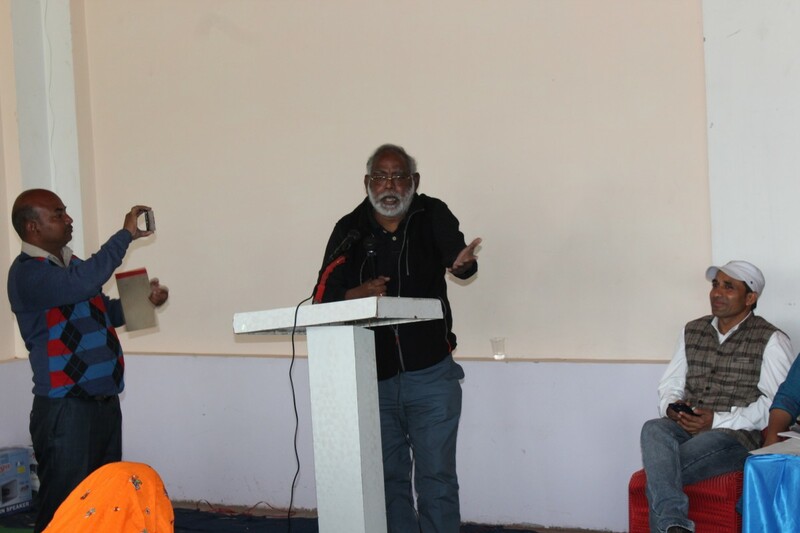 In Kerala and Goa, there is absolutely no problem with cow meat but in North India, they create a Hindu-Muslim divide over cows,” said John Dayal, a senior journalist and the keynote speaker at the event. “Here [Rajasthan] the BJP would seem to be more desperate and would like to revive the issues that can bring them support. The fact that Congress itself understands this and plays along instead of confronting, means the Congress is not sending signals to the bureaucracy that it should stop communalism and lynchings. The lynchings continue and then the police come and harass the survivors,” he added. Clad in a dhoti-kurta and wearing a traditional turban of Mewat, Shoibudeen was happy for the empathy that the victims of hate crimes were receiving, but didn’t sound too optimistic and said that he doesn’t think the status quo will change anytime soon. “There may not be any immediate result of these meetings, but at least people now have a platform to put out their problems. Prior to this, people didn’t speak a word on the atrocities they had to face,” Maulana Hanif, chief imam of the Alwar told The Wire. 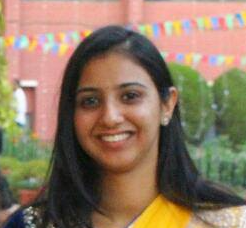 Shruti Jain is a freelance journalist.